Containers are a standard way to package apps and all their dependencies so that you can seamlessly move the apps between environments. Unlike virtual machines, containers do not bundle the operating system. Only the app code, runtime, system tools, libraries, and settings are packaged inside containers. Containers are more lightweight, portable, and efficient than virtual machines. For developers looking to kickstart their projects, the IBM Cloud Developer Tools CLI enables rapid application development and deployment by generating template applications that you can run immediately or customize as the starter for your own solutions. In addition to generating starter application code, Docker container image and CloudFoundry assets, the code generators used by the dev CLI and web console generate files to aid deployment into Kubernetes environments. The templates generate Helm charts that describe the application’s initial Kubernetes deployment configuration and are easily extended to create multi-image or complex deployments as needed. A developer generates a starter application with IBM Cloud Developer Tools. Building the application produces a Docker container image. The image is pushed to a namespace in IBM Cloud Kubernetes Service. The application is deployed to a Kubernetes cluster. IBM Cloud Kubernetes Service delivers powerful tools by combining Docker and Kubernetes technologies, an intuitive user experience, and built-in security and isolation to automate the deployment, operation, scaling, and monitoring of containerized apps in a cluster of compute hosts. The major portion of this tutorial can be accomplished with a Free cluster. Two optional sections relating to Kubernetes Ingress and custom domain require a Paid cluster of type Standard. 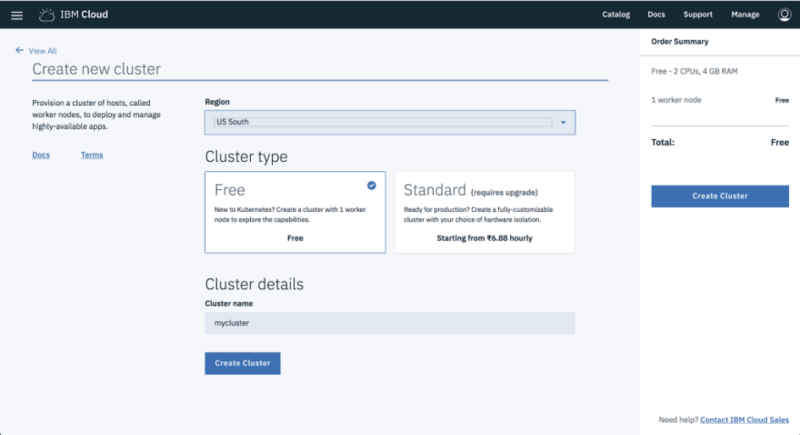 Create a Kubernetes cluster from the IBM® Cloud catalog. For ease of use, check the configuration details like the number of CPUs, memory and the number of worker nodes you get with Lite and Standard plans. Select the Cluster type and click Create Cluster to provision a Kubernetes cluster. 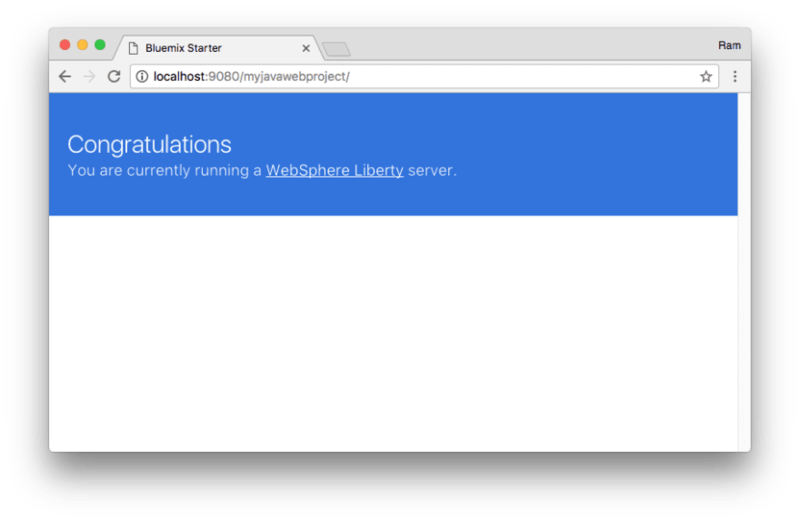 In this section, you’ll configure kubectl to point to your newly created cluster going forward. kubectl is a command line tool that you use to interact with a Kubernetes cluster. Use ibmcloud login to log in interactively. Provide the organization (org), region and space under which the cluster is created. You can reconfirm the details by running ibmcloud target command. The ibmcloud dev tooling greatly cuts down on development time by generating application starters with all the necessary boilerplate, build and configuration code so that you can start coding business logic faster. Start the ibmcloud dev wizard. 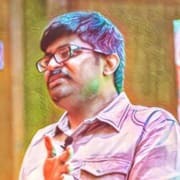 Enter unique hostname for your project. The host name is used if you deploy your application as a Cloud Foundry app .mybluemix.net. Do not add a DevOps toolchain, select manual deployment. Do not add additional services. This generates a starter application complete with the code and all the necessary configuration files for local development and deployment to cloud on Cloud Foundry or Kubernetes. You can build and run the application as you normally would using mvn for java local development or npm for node development. You can also build a docker image and run the application in a container to ensure consistent execution locally and on the cloud. Use the following steps to build your docker image. Ensure your local Docker engine is started. Change to the generated project directory. This might take a few minutes to run as all the application dependencies are downloaded and a Docker image, which contains your application and all the required environment, is built. This uses your local Docker engine to run the docker image that you built in the previous step. 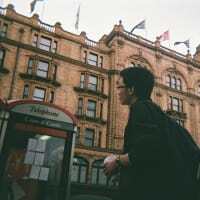 After your container starts, go to http://localhost:9080/. If you created a Node.js application, use port 3000. In this section, you first push the Docker image to the IBM Cloud private container registry, and then create a Kubernetes deployment pointing to that image. Find your namespace by listing all the namespace in the registry. If you have a namespace, make note of the name for use later. If you don’t have one, create it. Set MYREGISTRY env var to your registry. For Java app, replace with your project name and for node app with the name of the image ending with -run. On an IDE, navigate to values.yaml under chartYOUR PROJECT NAME and update the image repositoryvalue pointing to your image on IBM Cloud container registry. Save the file. You should see ==> v1/Service. Remember the Nodeport which is a 5-digit number(e.g., 31569) under PORT(S). This is your portnumber.